With a longtime interest in public policy, civic engagement and animal welfare, Dr. Emily McCobb has found the perfect way to combine her passions with her academic appointment at Cummings School of Veterinary Medicine. Earning her veterinary degree at Cummings School in 2000, Dr. McCobb later obtained a Master of Science in Animals and Public Policy (MAPP) and pursued her board-certification as a veterinary anesthesiologist. A transplant from the West Coast, Dr. McCobb was initially attracted to Cummings School because of its Center for Animals and Public Policy. As a veterinary student, she had the opportunity to work with Drs. Andrew Rowan, Gary Patronek and Nicholas Dodman on animal welfare-related projects. 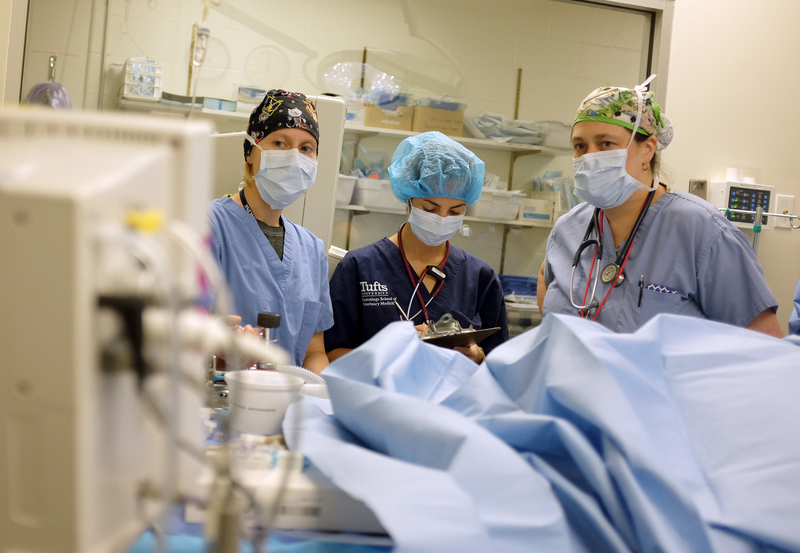 Through a hands-on internship at MSPCA’s Angell Animal Medical Center, she truly came to recognize the impact of human-animal interaction as well as the role veterinarians play in promoting the humane treatment of animals. This experience at Angell led her to seek a unique niche in veterinary medicine related to the human-animal bond. The ability to scientifically assess subjective states such as stress and pain in animals is a common theme of Dr. McCobb’s (far right) work. After completing her internship, Dr. McCobb enrolled in the MAPP program, which allowed her to explore animal welfare issues and enhance her research and writing skills. While in the program, she developed an interest in the welfare of confined animals, which she practices today in both the Shelter Medicine Program and Center for Shelter Dogs. She was also exposed to the work of Dr. Alicia Karas in laboratory animal pain and distress during her time in the MAPP program. With an eventual goal of contributing to animal welfare science, her next step was a clinical residency in anesthesiology and pain management. Today, Dr. McCobb’s research interests encompass a broad array of topics within companion animal welfare and policy. The ability to scientifically assess subjective states such as stress and pain in animals is a common theme of her work. As a veterinary anesthesiologist and public policy professional, she is focused on both maintaining animal health and protecting animal welfare. Whether it’s researching patterns of injury in abused animals, finding ways to improve clinical teaching, creating mechanisms to ensure veterinary care is accessible to all animals, or promoting the welfare of confined animals, Dr. McCobb’s number one priority is finding real-world solutions for serious societal issues facing animals who live among us. In addition to her roles as a veterinarian and researcher, Dr. McCobb is the Director Tufts Shelter Medicine Program, Director of the Luke and Lily Lerner Spay/Neuter Clinic, Assistant Director of Tufts Center for Animals and Public Policy, and a Clinical Associate Professor of Clinical Sciences. 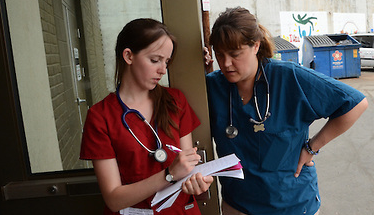 The combination of her roles offers a unique perspective to Cummings School students within the MAPP and DVM programs. Dr. McCobb teaches, mentors, and advises students in the Master of Science in Animals and Public Policy program. 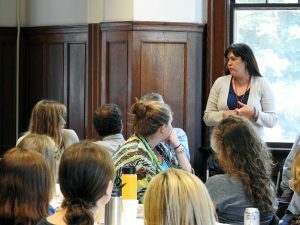 Along with her teaching responsibilities, Dr. McCobb also advises MAPP and veterinary students throughout their tenure, including collaboration on animal welfare-related research projects. Within Cummings School’s teaching hospitals, she supervises third-year veterinary students in small animal anesthesia. She is committed to providing students a vehicle to engage in programs aligned with civic life, a hallmark of the University’s philosophy. These experiences allow students to develop the knowledge and practical skills needed to make a positive impact in the world. For Dr. McCobb, her professional path was paved on a trip to the East Coast shortly after undergraduate school, in pursuit of combining her passion for animals, science and public policy in veterinary school. Following that path has led her to a mission-driven career and the opportunity to impact the lives of thousands of underserved animals as well as the next generation of their caregivers.